The revolutionary STS “Space Technology Safety” stirrup irons feature a very strong tread/foot grip to prevent feet slipping. In addition the unique angled design and the centre and small outer bar prevent the feet slipping forward even over big fences and thereby keeping the rider balanced on the ball of the foot their heels down and on the horse at all times. Other major and unique benefits include an elevated angled and extended platform giving the rider additional foot support and excellent balance. Riders have stated the added support also reduces stress to the knees, legs, ankles and feet. 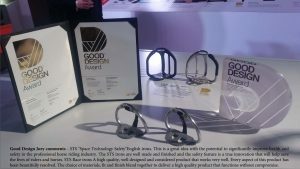 The STS irons reduce falls and in the event of a fall, the open section allows the boot to come out, which can prevent a rider being hooked up and dragged. Traditional irons do not have these unique features, and therefore, the riders’ feet can slip forward taking them of the ball of the foot making them unbalanced and at a high-risk foot position of being hooked up and dragged. The STS race irons used by champion jockeys worldwide. Revolutionary Equestrian stirrup iron used by the world's best riders. Western stirrup iron also suitable for western fender saddles.